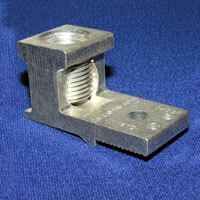 Single Hole Mechanical Lugs with Turn Protection | Cal Fasteners, Inc. These single hole solderless lugs from CMC feature unique anti-turn features. Manufactured from high strength 6061-T6 aluminum alloy material, the provide unparalleled strength and electrical conductivity. These mechanical connectors are dual-rated for use with copper or aluminum conductors. An electrotin plating protects against corrosion and provides low contact resistance. Assembly requires only a screwdriver or allen wrench (depending on model). Connectors are reusable. All CMC products are manufactured in North America and are UL and CSA listed and RoHS compliant. Request a quote on CMC single hole solderless lugs for your application, or contact Cal Fasteners to learn more.